While the leaves begin to change colour, we would like to take a moment and share some of our changes! Below you will some some additional product refreshes on some of our gas fireplaces. Take a look! I hope you’re as excited as we are! Based on customer feedback and demand, Heat & Glo has added new Driftwood Logs and River Rock Stone media for all PRIMO fireplaces. The Driftwood Logs are sure to evoke emotions of nights gathered around an authentic beach fire, while the beautiful River Rock Stone replicates stones commonly found in North American rivers. 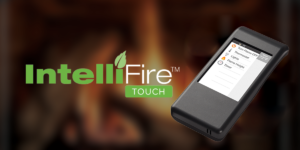 The SlimLine X Series is being upgraded with new IntelliFire Touch controls. Instead of an RC300 remote control, each SlimLine X fireplace will now include a touchscreen RC400, which is more intuitive and offers more control. The beautiful fire, framing and all other fronts, accessories and options will remain the same. The fireplace SKU numbers will change with the addition of IFT at the end. For example, SL-7X will become SL-7X-IFT. Showroom displays can easily be upgraded with an SLMR-IFT-UPK kit. This kit is also approved for use upgrading aftermarket, previously installed SL7X fireplaces. The new version of the Slimline X Series will be available by November or while current quantities last. Stay tuned for Octobers blog for more!